I am very experienced in working with schools, colleges and universities to provide music lecturing and group tuition in advanced areas of drumming and music technology. Having toured nationally with electro and acoustic acts, and taught students at all ages and levels, I have a broad base of expertise on which to draw for my lecturing. This enables me to tailor classes to ensure that the content is both interesting to the student and practical for the advancement of their studies. Most commonly I deliver lectures to groups of up to 20 students all around the West Midlands area. 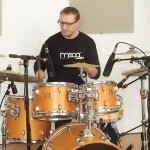 Workshop topics have ranged from basic drum styles, through maintenance and tuning of the instrument, and included advice for musicians on practical techniques to survive in the music industry. 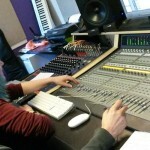 One area in which I have particular experience is the use of MIDI triggering and sequencing. This is a vital component of any modern recording drummer and enables players to expand beyond the instrument into sound design and production.